No stamping for me this morning. 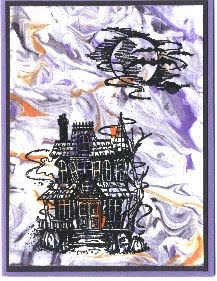 I thought I would share a card from years ago that reminds me of the haunted house set in the catalog now. I always liked this image with the shaving cream background. Perhaps something you may want to try if you have the current set. It has been at least 5 years since I made zucchini bread. Actually it was a zucchini apple bread that I made. I wanted to try a different version of zucchini bread. Zucchini blueberry sounded good and I have a lot of blueberries in the freezer for the lemon blueberry bread that I make and for the kids to make smoothies. I crammed the batter into 4 mini loaf pans, but you really need 5 to make it easier to get out of the pan. My husband is not a fan of zucchini and comments how his mother would sneak it in on him but he really liked the bread. I only had a couple of kids brave enough to try the bread but they liked it. 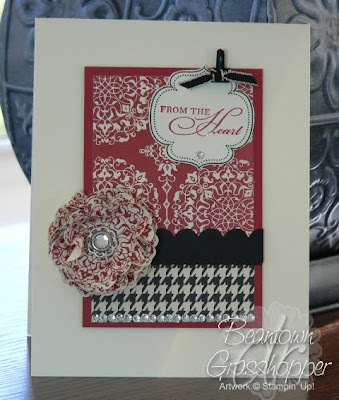 Same basic card, shown two ways, one with a simple thank you and the other with the pearls. I hope they eventually come out with vanilla pearls. As soon as I had this thought this morning, I was thinking the catalog has only been out 2 months and I'm already wanting something more. I still have so much to use from this one. 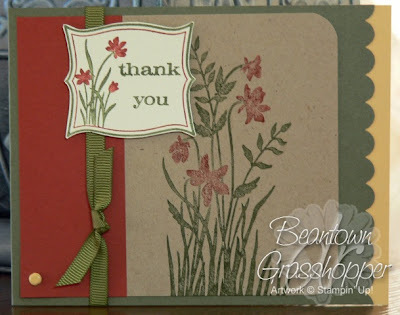 When I first got the Day of Gratitude set, I had the Blossom Party die on my desk and I wondered if that pointy-tipped flower would work with this image. It does! I actually would change my color choices around, but I had a limited amount of time and I went with what I started with and made it work. If you click on the image, you will see that I pierced a circle around the cajun center to add a little something. The colors are a bit off in my picture but you're familiar enough with them to know. I went to bed with an idea of what I wanted to stamp this morning. I went to my desk to begin and couldn't start because everything is such a mess. I started putting away markers from yesterday's card. Then it was packages of cardstock that were still out. Needless to say, I spent close to two hours cleaning up, I'm still not done but I need to move on to my "list" for today. I'm posting like I usually do and I'll be back tomorrow, hopefully with the idea I had last night. You may be wondering what the picture above is. A few weeks ago I received an envelope with the badges I earned this summer for VC Rocks. They don't usually have badges but they were celebrating 10 years. I think it was a brilliant idea and probably helped the group to be more active. I know I participated in a couple of things I don't usually do. Isn't that the truth? Time doesn't always permit talking with them, distance gets in the way of getting together, but they are always there and things pick up right where they left off. I'm definitely blessed with the friends I have. 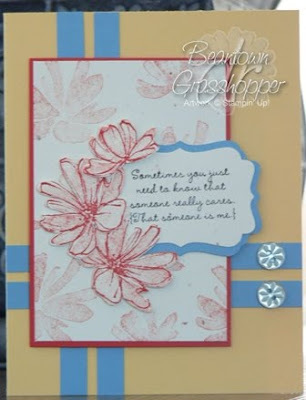 I'm participating in a swap where you the primary color needs to be a new color, and you need to use a new stamp set. I'm pretty jazzed with how this card turned out. I didn't have any Pear Pizzazz ribbon so I colored the white taffeta ribbon with the pear marker. Those of you that visit my blog regularly know that I love this set. 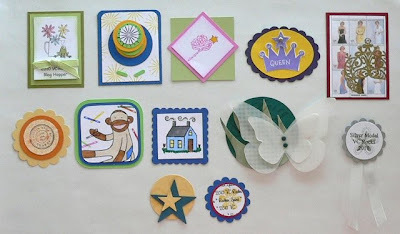 I'm happy to share it on the SU Stars blog hop today. If you would like to start at the beginning of the hop, you can start at the SU Stars Blog. Hopefully, you are already on the hop and just came from Denise Foor's blog. 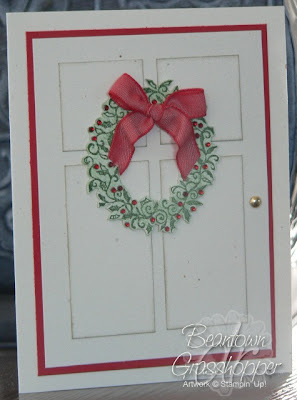 I loved all of the textures on the wreath that Denise created using Stampin' Up! 's DSP, embossing folders and her Big Shot. If you have gotten the Autumn Spice DP, you've probably noticed that on the paper with all the leaves, there is a background in more mustard. 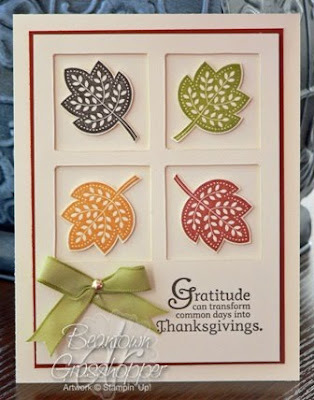 After I stamped the leaves, they just seemed so bare on the cardstock so I got out the Sanded background and stamped it in More Mustard to go along with the paper. These are the cards from the Christmas/Winter swap I participated in last month. I was asked to make some Christmas cards and I made several samples. I have to admit that this card looks fairly simple, but it is time consuming with all of the cutting. As I was cutting between the camels' legs, I was hoping this wouldn't be picked as "the one" that I had to make 50 of. The picture doesn't capture it well, but the oval has the gold Smooch spritz on it, and it looks fabulous with the shine. When I bought this set, I envisioned the wreath acting as a frame to another image, or perhaps a sentiment inside. Yesterday I took time to stamp in the afternoon, which I don't usually do. My morning session was a bust and what I had made didn't turn out post worthy so I was determined to make something that I liked. The idea isn't new but it turned out well. I used two different colors of red rhinestones on the wreath. I sponged River Rock ink on the door panels to define them more. I sponged Garden Green ink over the wreath. I planned to spend some time this weekend CASE-ing cards that I've saved over the last little bit. I didn't do any stamping at all. I worked on different projects, we went to a BBQ and it was just another typical weekend around here carting the kids to be with the their friends. 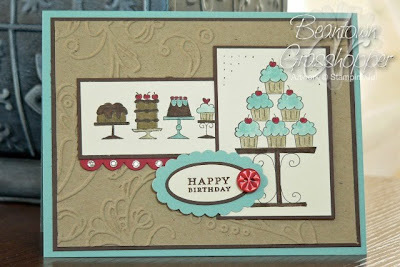 Mary posted this card yesterday for a clean & simple sketch challenge. As soon as I saw it, I wrote her to say it was awesome and I would be making it. I know I've told you before, but she is one of those people that you know whatever she makes, it is going to be good. 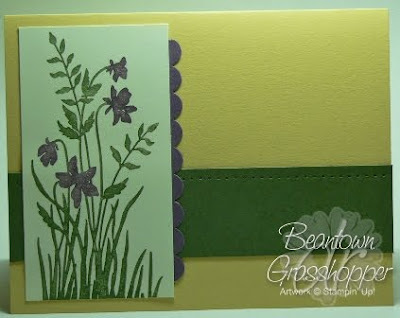 Go to her blog for the directions on this card. She even gives measurements. Super easy if you have the punch and if you don't, it isn't bad. I didn't have the right size square punch so I ended up using a knife to cut out the squares. I bought a square punch once and wondered why. It is pretty easy to cut a square with a paper cutter. For the first time, I can see a need for a square punch. I have to admit this isn't my favorite card. I'm going to retry the sketch later. I went from what I remembered seeing yesterday and when I was going to link to it, I realized I omitted a layer. I haven't used the Poppy color yet, so I went with one of the suggestions from the color coach. Again, not my favorite. I will hopefully re-work the card this weekend and have an improved version to share. So, my brain is mush. Perhaps why I'm struggling to come up with anything today. As I was putting the card together, thinking how tired I am, I realized I've had 16 hours of sleep total in the last 5 nights. I hope to sleep in tomorrow. Right now I'm getting ready to do some grocery shopping, tidy up the house and hopefully clean the porch before the kids get home. Tonight is a football game, last week was a scrimmage. I'm behind schedule this morning for posting. Yet, for a Wednesday, I'm ahead. I don't usually get to shower until dinner is in the oven but I did that instead of stamping this morning. I still need to go to school but I don't have a set time to show up today, so I could still get some stamping in. You can never go wrong with red and black. For the punched flower, I punched a row, centering the filigree design for each punch. On either end, it doesn't all fit, so I picked the one that would fit most of the design and used it as my back layer. Maybe I'll have to write a little note to my husband now.